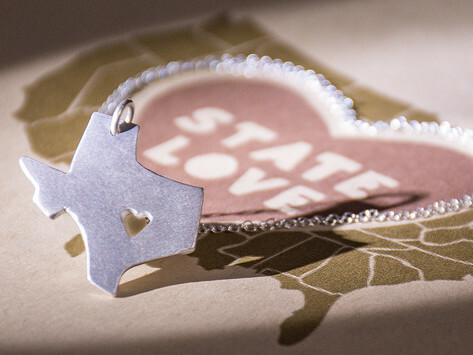 Give a gift a loved one will treasure with this State Love Pendant from Precious Metal Prints. Made in the USA, this matte-finish sterling silver state pendant is a beautiful way to show state pride. Pendant Dimensions: Vary by state: 0.5" - 1" x 1"
Beautifully made. Well received Christmas present. I got this for my mother-in-law's birthday. My inlaws now reside in TN and she loved the OH love pendant! Some gifts are just destined to become keepsakes. That’s especially true of Precious Metal Prints custom-imprinted pendants. These custom charms are the brainchild of Precious Metal Founder, Grant Barton. Wanting to give his wife a gift she’d treasure forever, Grant used some special clay to take impressions of his son’s fingerprints. Using that as a mold, he handcrafted a pendant that his wife could wear as a necklace. It received so many compliments, a business was born. Today, Precious Metal Prints are still handcrafted in Knoxville, TN from a mold you make yourself using certified-safe clay the company sends you. 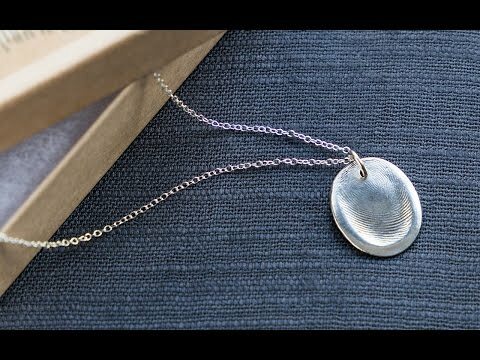 Simply take an impression of your loved one’s fingerprint—or nose print, if your loved one is of the 4-footed variety—and mail the kit back to Precious Metal. In a couple of weeks you’ll receive your custom charm on a shining chain—a wonderful, personalized gift that belongs close to your heart.